And again for another year, a Big THANK YOU to Cathy Young for volunteering to head up the concession and doing an OUTSTANDING job! Thanks to Gary Young and the rest of the Young family that did a great job of getting the concession supplies to the site and helping out in the concession. Thanks again Young family. And Thanks to all those that volunteered time working in the concession and donating supplies for the concession. The menu for both days provided convenient, good food for all attendees. 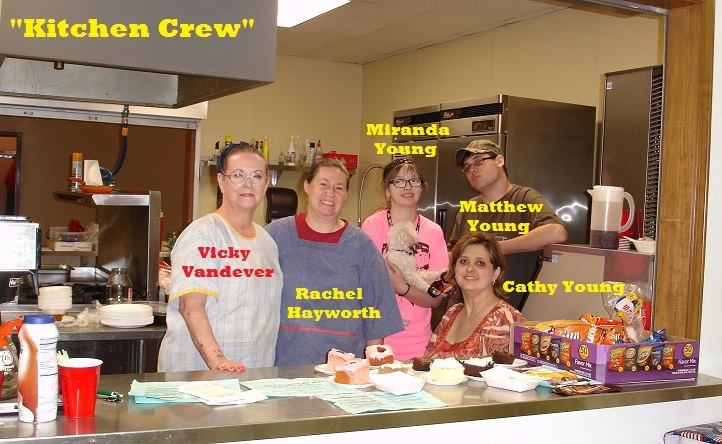 Here is the only photo I received of the “Kitchen Crew” and I know there were many more that helped out either working in, donating and providing food, or both. Again Thanks to all!